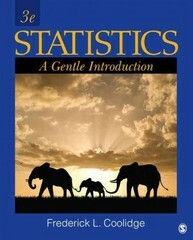 Statistics 3 Edition With Statistics: A Gentle Introduction, Third Edition, an introductory stats class needn't be difficult or dull! Frederick L. Coolidge specifically designed his text to curtail students' anxieties and minimize unnecessary formulas, while providing a comprehensive review of basic statistical designs and analyses. A wealth of additional real-world examples have been included to give a sense of how the science of statistics works, solves problems, and helps us make informed choices about the world we live in. The author minimizes the use of formulas, but provides a step-by-step approach to their solution, and includes a glossary of key terms, symbols, and definitions at the end of each chapter. Every chapter also includes a short story about historical and contemporary statisticians who figured prominently in the evolution of the discipline of statistics. New to the Third Edition is the thorough incorporation of SPSS throughout, more visual material and figures, and an enhanced treatment of effect sizes, and more detailed explanation of statistical concepts.